Nur ein einziges Fass dieses äußerst selten vom Weingut frei gegebenen Weines ist abgefüllt worden!!! Wir sind stolz, Ihnen einige wenige Flaschen anbieten zu können. 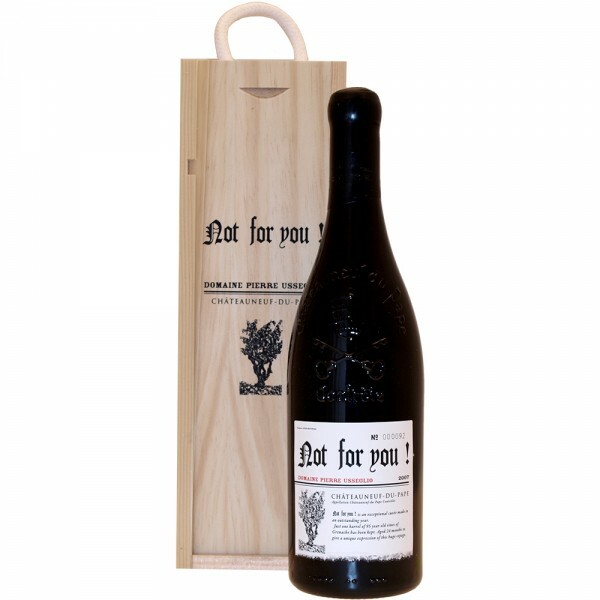 "From 90-year-old Grenache vines planted in the sector of Les Serres, one barrel of a 2007 Chateauneuf du Pape called Not For You was produced. It's a play on words so to speak because the alcohol levels are through the roof and it took 30 month to ferment dry. It is similar to what Henri Bonneau does with his Cuvee Speciale in years where he has made that wine (1990 and 1998). It is an Amarone-styled Chateauneuf du Pape with over-the-top richness, full-bodied, massive extract, great purity and loads of kirsch, grilled steak juices, herbes de Provence and lavender. A classic albeit gargantuan Chateauneuf du Pape, a glass or two will provide a considerable buzz given the elevated alcohol. It is a singular wine that will no doubt be controversial, but I loved it."